Calcium with Vitamin D3 is a great product. 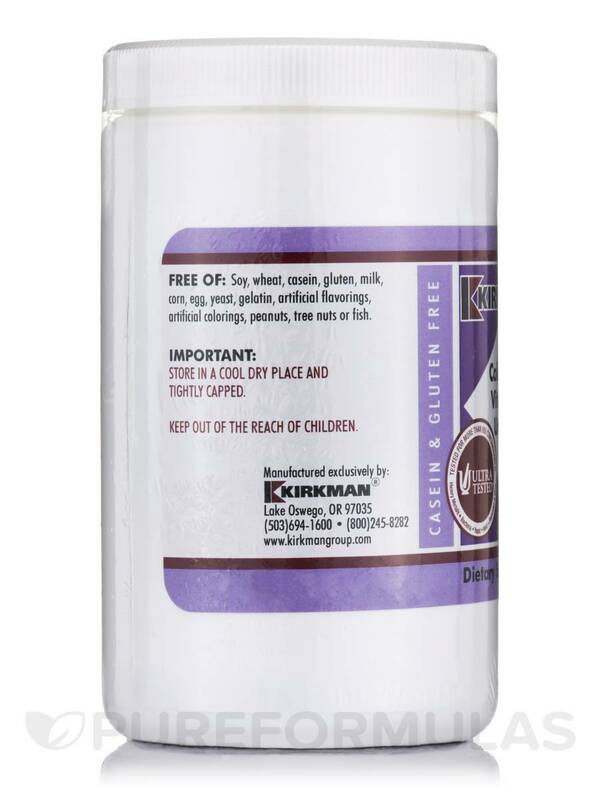 Calcium with Vitamin D3 Unflavored Powder by Kirkman is so easy to take! I put in any liquid and drink. Calcium without a pill and you take a small amount! 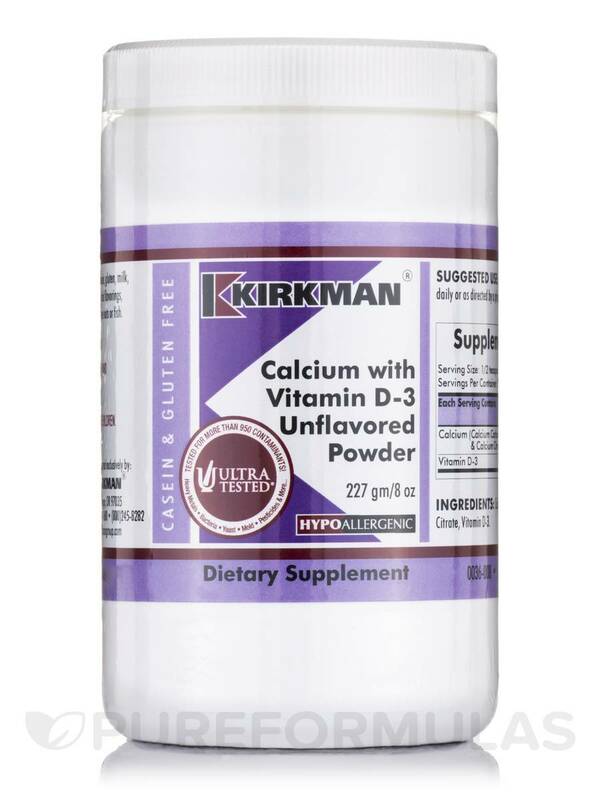 Calcium with Vitamin D3 Unflavored Powder by Kirkman really has no taste, which surprised me! It also has no unnecessary ingredients which I like. I have no problem with it, I think I prefer to take the capsules because it is faster to use. Supports heart function‚ circulation‚ nerve function‚ bone mass and muscle tone. 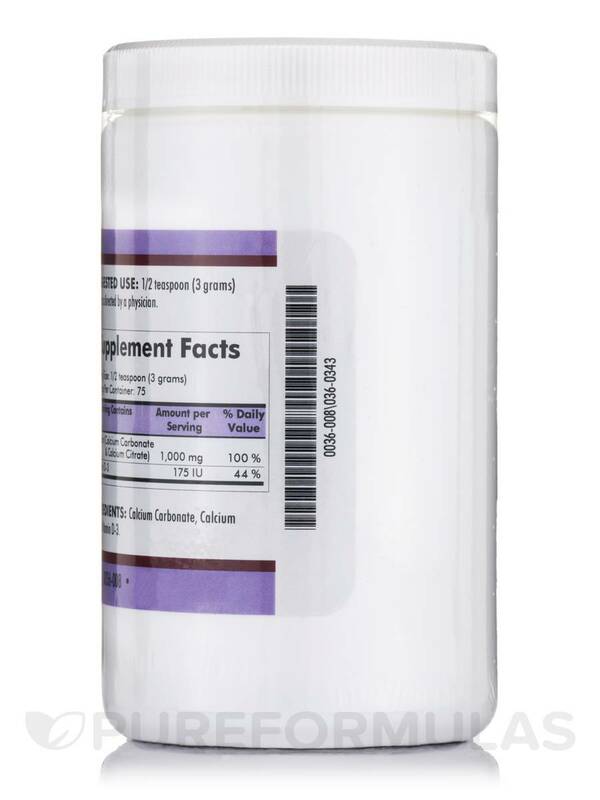 This is an unflavored calcium powder made from a blend of calcium carbonate and calcium citrate with vitamin D-3. The powder mixes easily in food or beverages and can be used in baking at moderate temperatures. Hypoallergenic. Gluten and casein free. Ultra Tested®. Calcium is a mineral that is an important component of a healthy diet and necessary for life. Approximately 98% of the body’s calcium is stored in bones and teeth. Calcium is critical for building bones and teeth during childhood and for maintaining strong bones and teeth thereafter. In the rest of the body‚ calcium supports heart function‚ circulation‚ nerve function and muscle tone. Vitamin D increases the absorption of calcium‚ so it is important to make sure your diet contains sufficient amounts of that nutrient. 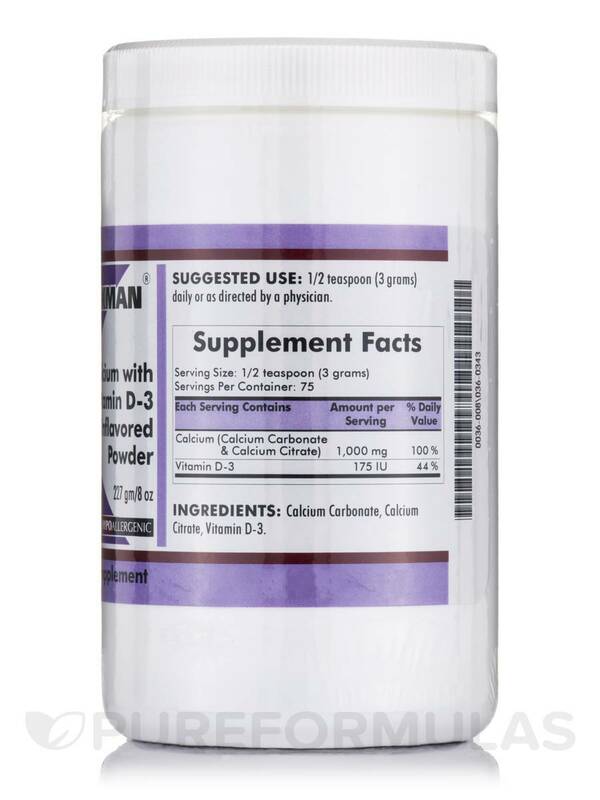 Kirkman’s calcium capsules use Bisglycinate amino acid chelate‚ which has been demonstrated to have superior absorption qualities. 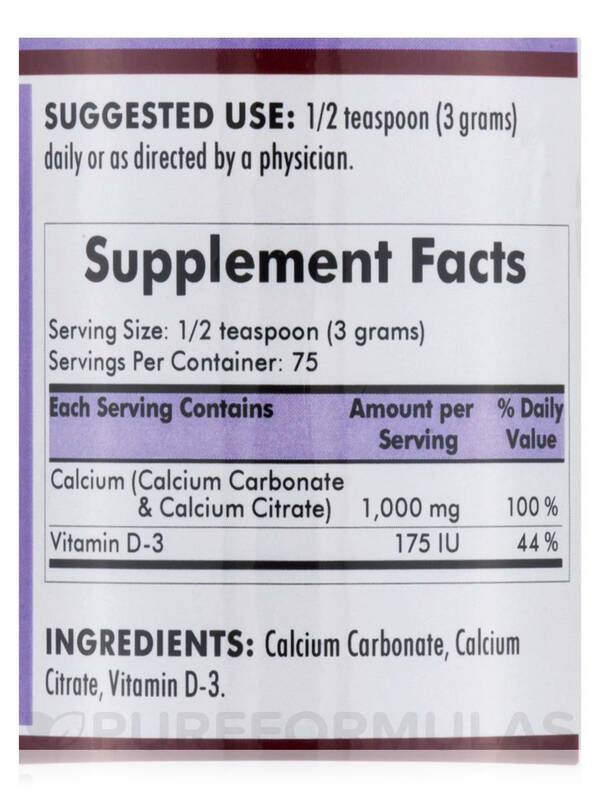 Calcium Carbonate‚ calcium citrate‚ vitamin D-3. 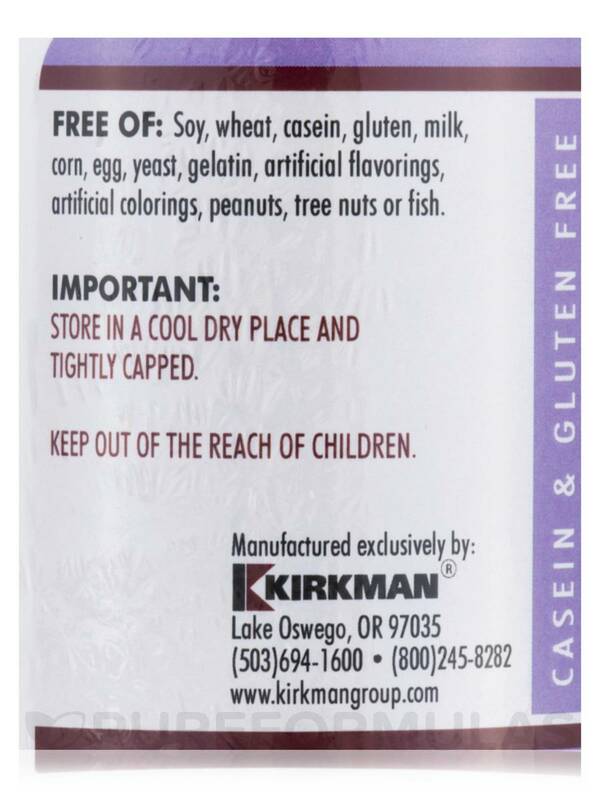 Casein‚ gluten‚ soy‚ yeast‚ milk‚ sucrose‚ preservatives‚ flavorings‚ colorings‚ gelatin‚ egg‚ peanuts‚ tree nuts or fish. 1/2 teaspoon (3 grams) daily or as directed by a physician. No pill easy to put in liquid or in food. No taste, after taste, no fillers or unnecessary ingredients. No flavor high potency mixes well. Great! mix it in with baby food pears and he will swallow it when he was not able to swallow pears nearly tasteless and non-allergen. have to mix in with something to get my child to take it.